Browse content similar to Merseyside Special. Check below for episodes and series from the same categories and more! Welcome to one of the most iconic cities on the planet. and rolled their way across every sea to every nation. the most successful clubs in English football. whilst that way Liverpool's mighty red stands of Anfield. and behind me are the next chapter, is that right? 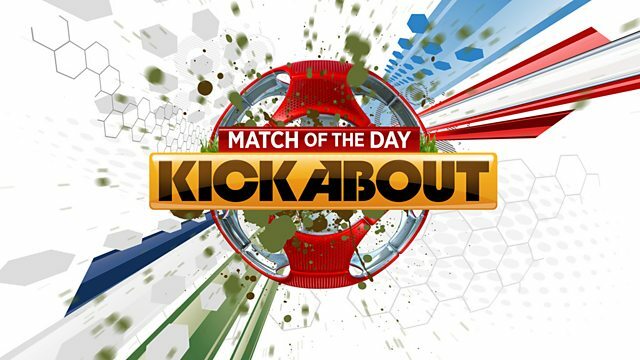 MUSIC: "MATCH OF THE DAY" THEME TUNE. that there are some pretty talented youngsters around. Guys, would you like to see him do some free styling? Oh, round of applause for John Farnworth! Oh, that was brilliant, as expected, John. Now, what are you going to be focusing on today? so I wanted to focus on that today, if that's all right. up who knows a thing or two about hitting the crossbar. of superfans telling us all about the blue half of the city. Home of Everton FC, the greatest football team in the world. Before every game, toffees are thrown into the crowd. Probably the biggest club legend is the man, Dixie Dean. In the 1927-28 season, Dixie scored a whopping 60 goals. Romelu Lukaku has been putting the men all season. Romelu Lukaku has been puttig them in all season. Brilliant first touch, can he get the second oh, you can! We also had a legendary goalkeeper, big Neville Southall. He made 750 appearances for the club. That's 200 more than any other player. Everton have won the league nine times. And won the Uefa Cup Winners' Cup once. We're going to win the Premier League next year. That was a great tour around every turn. That was a great tour around Everton. Are there any goals that stick out for you? Lukaku against Chelsea last year in the FA Cup. He just ran through the defence and just put it in. Lukaku and Lennon heavily outnumbered. Lukaku shows great strength there, though, and goes on. from all the years Everton has been around that stands out for you? do that, so he's definitely my favourite since Everton was founded. Duncan Ferguson, because he was strong, tall and courageous. Decent cross from Ferguson's header, and Everton are back in the lead. There's so much history in this fantastic footballing city. underneath the ball with the auto, it goes up and onto the bar. It's just a chip, but behind the standing leg. he scores. Did he level about?! What a goal from Ross Barkley! fan I had loved for Liverpool as well because the players they had. their day, but believe it or not, Liverpool isn't just about football. Here's a few stars of Bellfield academies show us around the city. CHEERING. Welcome to Liverpool. This is our city. world-class football teams. Well, at least one of them. Maybe this one. course I will. Excellent, can't wait to see that. you out and knowing my luck I will miss every time! LAUGHTER. too, but for now, see you. Goodbye!